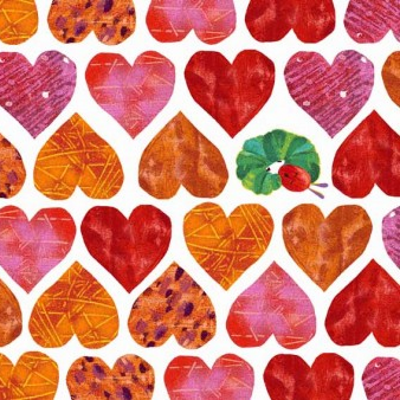 Endpaper Hearts. This fabric is excellent quality 100% printed cotton which can be used for patchwork and quilting, home decor, light to medium weight curtains, cushions, craft projects and for making beautiful clothes. Please note the price is for 1 Fat Quarter of Makower UK Very Hungry Caterpillar fabric. For 1/2 Metre of fabric, add 2 units to your shopping bag. For 1 Metre of fabric add 4 units etc.